Sebastian Smee of the Boston Globe has been doing a series all summer called Frame by Frame where he focuses his attention on one particular work of art. These pieces are brief but insightful, a serialized reminder that Boston is full of masterpieces hanging in permanent collections. Yesterday’s piece featured a painting by Matisse in the Worcester Museum. 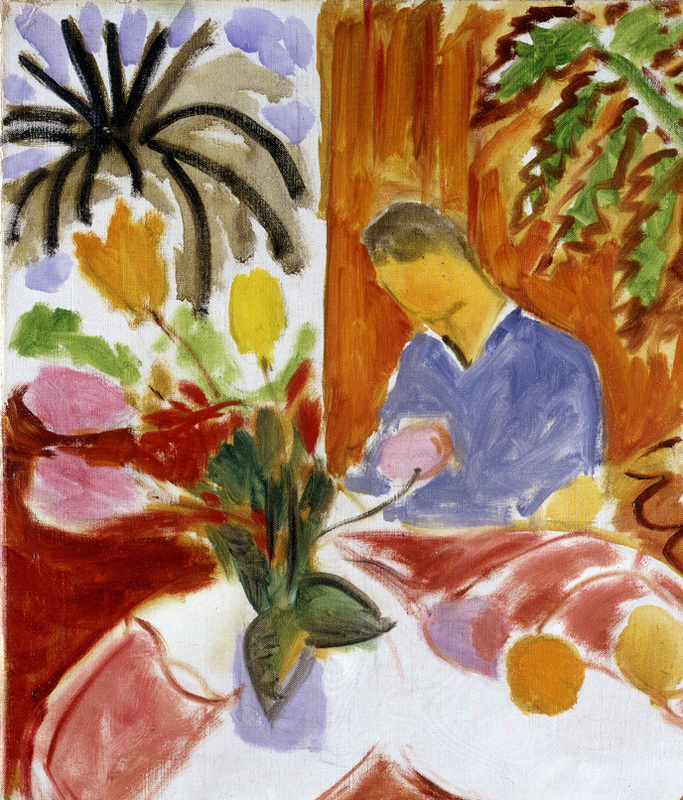 Smee’s titled his response to Petit Interieur, “Ease belies the effort”, and his commentary on this later Matisse (it was painted in 1947) confronts the mystery that is at the core of Matisse’s oeuvre. His signatory effortlessness was anything but effortless. That ease and flow was hard won. The painting is about conferring balance and proportion on rapturous sensuality – dizzying beauty with no diminution on either side. Things are not as they seem. Matisse’s personality did not possess the laid back ease of his lollygagging odalisques and his light-infused interiors. Turns out it isn’t a requirement. What a relief! In many ways art making can be the way we possess the qualities we don’t embody easily, to evoke moods, auras and existences that are vastly different from the ones we inhabit. Oh, how I wish we had a Sebastian Smee writing here for the Post. You final comment recalls how people sometimes mistake the “I” in a poem, particularly if the poem is effective, for the poet. To be able to slip into that voice not necessarily one’s own is a gift received. I like that connection Maureen. It isn’t one I had thought of, and a valuable add. Thanks. I’m not sure that this effortless looking painting of Matisse’s actually was actually so effort-filled. I see it more that he trained and and worked and “efforted” and climbed that steep stony mountain in order to get, on occasion, to the place of effortlessness. And there he could create works such as this. Or maybe that’s what you are saying! It’s such an interesting point you make in your last paragraph, Deborah. It’s possible that the tension that arises from working against our proclivities adds greater depth and interest to the work. Sally, I do think that is Smee’s point–Matisse worked like a dog his whole life to capture that appearance of effortlessness. Which makes it that much more admirable IMHO. And thanks Altoon for your comment. There is that old adage of how doctors pick their specialities (which I won’t go into here) that also applies to artists I believe. As the saying goes, everything is autobiographical, and the nature of our work is anchored deep in us. Deborah and Altoon–Perhaps it is the dialog between one’s intrinsic nature and a yearning for what we imagine we could do or be that makes for the most satisfying work. Tamar, Thank you for stopping by and for your thoughtful comment. BTW I’m a big fan of your work and hope we have a chance to meet in person at some point in the future. Oh boy what a terrific painting and both of you writing about it. Love Sebastian Smee and you too Deb. This whole topic is one that’s been on my mind a lot lately as I get older and life seems to pinch more I want the paint to flow more effortlessly. Love your comment re how doctors pick their specialities, can I use that bit in my blog? Ann, Just back from Maine. Of course you can use that bit on your blog! I’d be flattered if you did. Thanks so much for your kind words, and let’s do coffee sometime soon.